TSKgel PWXL columns are composed of spherical, hydrophilic polymethacrylate beads. 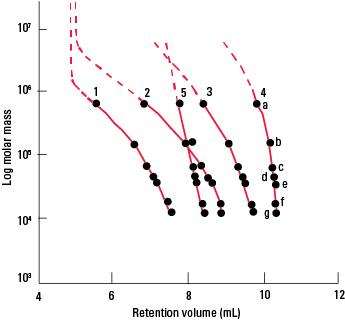 The main application area for these columns is the analysis of water-soluble polymers, such as celluloses, acrylamides, glycols, dextrans, polyvinylalcohol, and oligosaccharides. See the table on the TSKgel PW columns page for typical samples and suitable eluents. 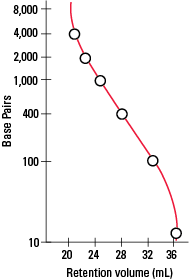 The figures below show the calibration curves for all TSKgel PWXL columns. 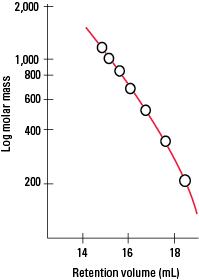 TSKgel G-DNA-PW is available for the analysis of large polynucleotides, such as DNA and RNA fragments of 500-5,000 base pairs. 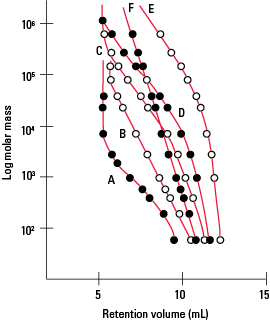 TSKgel G-Oligo-PW is the preferred column for the high resolution analysis of aqueous nonionic and cationic oligmers and oligosaccharides such as hydrolyzed cyclodextrins. TSKgel SuperOligoPW contains smaller particles and semi-micro dimensions compared to the TSKgel G-Oligo-PW column, enabling high speed separations with high resolution of aqueous oligomers. 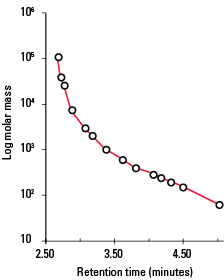 The mixed-mode column, TSKgel GMPWXL, has an extended linear calibration range, suitable for samples with a broad molar mass (MM) distribution and unknown samples.